Researchers may have just scratched the surface of a major new dinosaur site nearly inside the Arctic Circle. 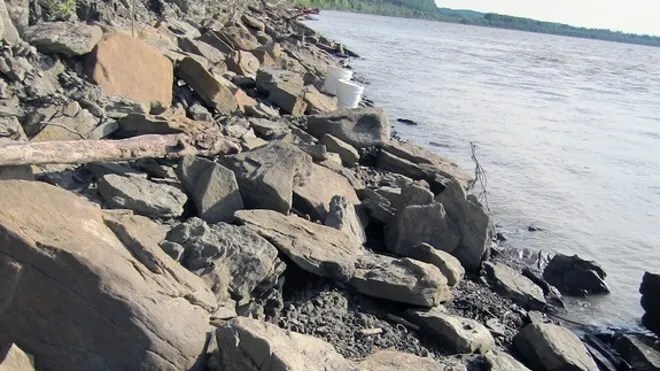 This past summer, they discovered thousands of fossilized dinosaur footprints, large and small, along the rocky banks of Alaska’s Yukon River. In July, the scientists from the University of Alaska Museum of the North embarked on a 500-mile journey down the Tanana and Yukon rivers; they brought back 2,000 pounds of dinosaur footprint fossils. In the last decade, dinosaur footprints have been found in Alaska’s Denali National Park, left in rocks that formed 65 million to 80 million years ago, during the Late Cretaceous Period. The new prints along the Yukon River might date back 25 million to 30 million years earlier, McCarthy said. Pat Druckenmiller, the museum’s earth sciences curator, added that a find of this magnitude is rare today. The dino tracks were preserved in “natural casts” formed after the creatures stepped in mud, and sand filled in their footprints. The result? Fossils that look like “blobs with toes,” Druckenmiller said. The researchers say they have much more work ahead of them to understand and describe their findings. They are working with local villages and Native groups to coordinate future expeditions in the region.